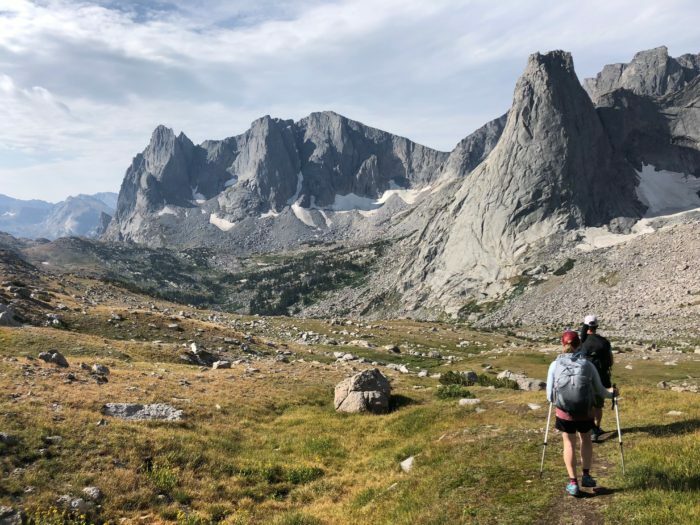 I recently spent a few days backpacking through Wyoming’s Wind River Range with Therm-a-Rest as they debuted their new, sub-two-pound ultralight sleep system. We loved this system as soon as we saw it at Outdoor Retailer last month, so I was amped to try it out. Along with discussing the variances between hobbyist bird watchers and Aggressive Birders, bagging a Sick Peak©, and officially accepting that I am not smart enough to use a tarp tent, our group gave Therm-a-Rest’s new sleep system a test in some classic Winds weather. 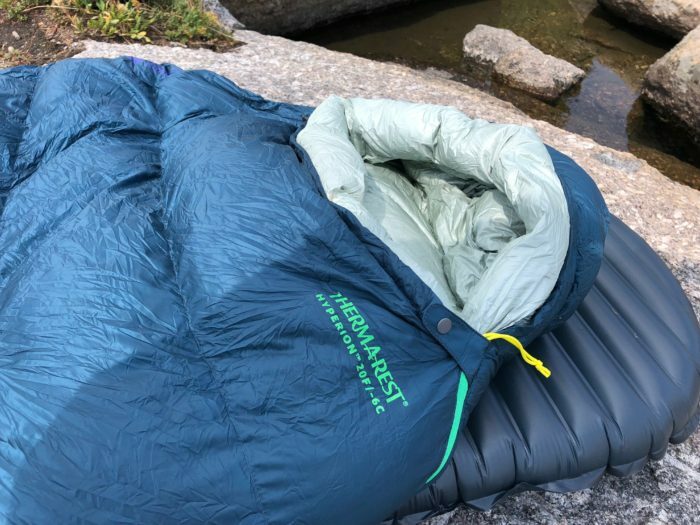 Therm-a-Rest’s new ultralight sleep system will be available for spring 2019, and includes the 8.8-ounce NeoAir Uberlite sleeping pad, one-pound Hyperion Sleeping Bag, and 15-ounce Vesper Quilt. The Vesper and Hyperion are both filled with 900-fill NikWax treated down, which stays lofted 60 times longer than untreated down. 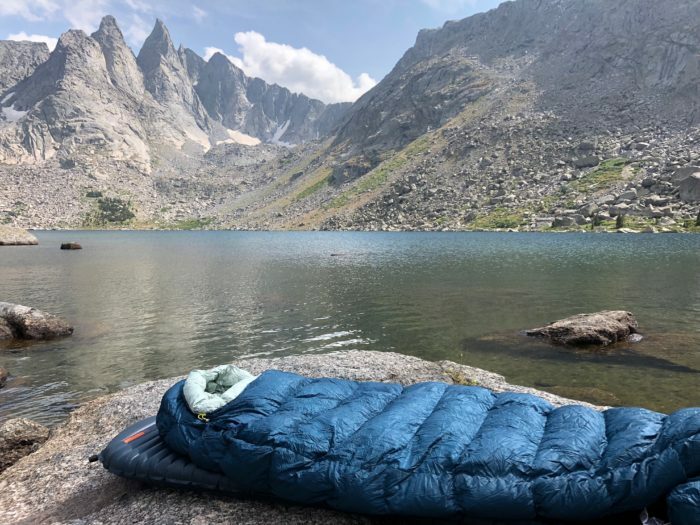 The UberLite Sleeping Pad offers backcountry warmth and comfort while packing down to the size of a beer can. 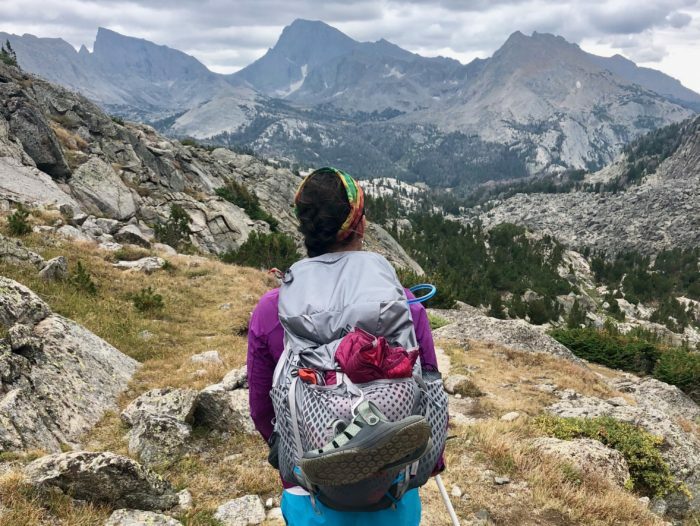 These items are game changers for lightweight, comfortable backpacking, and will likely be new favorites for long-distance backpackers. The UberLite is an update to the NeoAir XLite, by far the most popular inflatable sleeping pad for thru-hikers. 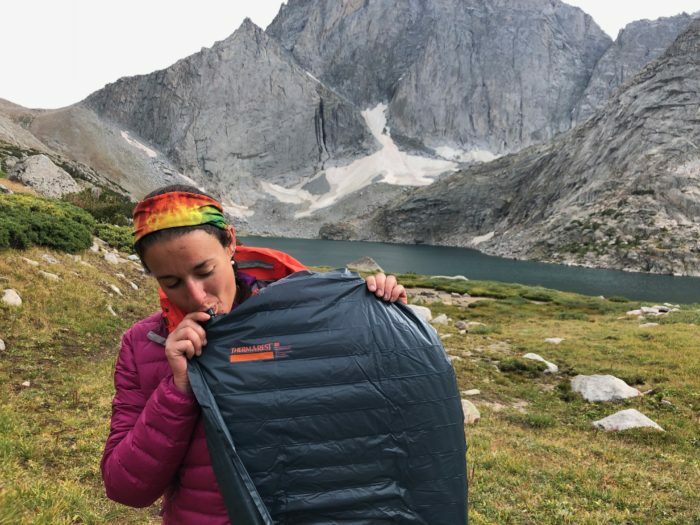 Weighing just 8.8 ounces, the UberLite utilizes Therm-a-Rest’s Triangular Core Matrix interior, inflating to 2.5 inches and offering an R-Value of two. It inflates fairly quickly and seals well, and was comfortable to sleep on despite plummeting temperatures and rocky ground. It feels just like the XLite, minus a few ounces and with a slimmer packed profile. For comparison, the NeoAir Xlite has an R-Value of 3.2 and weighs 12 ounces, and the NeoAir XTherm has an R-Value of 5.7 and weighs 15 ounces. 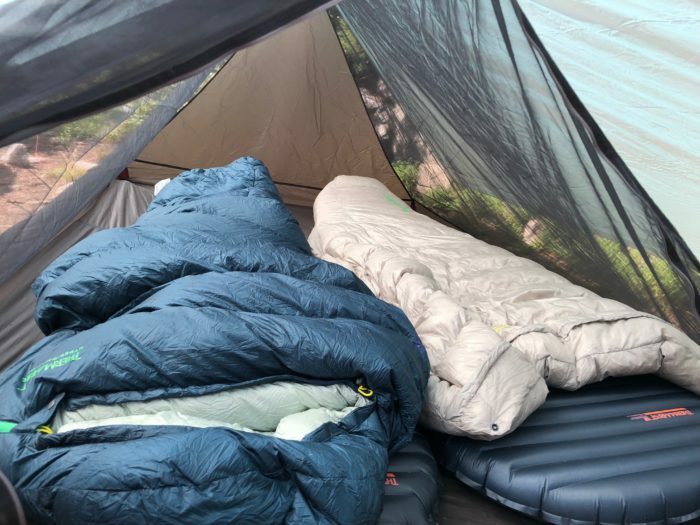 The temps dropped severely during our trip, and between the mummy bag and the sleeping pad, I did not feel any conductive chill from the ground. The Uberlite can fit in a jacket pocket, packs down to the size of a beer can, and offers the comfort that has made me a NeoAir fan for years. 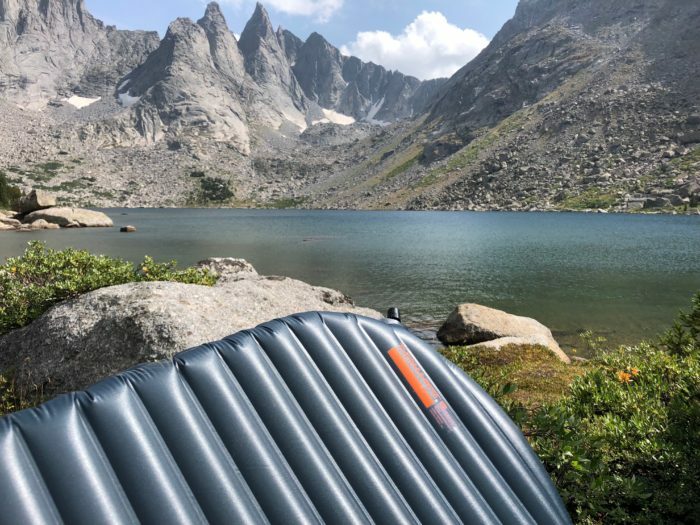 I’m interested to see how this update to an already lightweight pad holds up over the duration of a long-distance hike. Therm-a-Rest shaved weight with their face materials, and while it feels durable, remember to be careful and don’t go bashing it on rocks for fun. The NeoAir Uberlite will be available in spring 2019 for $179.95. You never like to think the words “Thank god this down is hydrophobic,” as you pull the hood over your head in an attempt to dissociate from the current conditions, but it’s nice to know you have at least some protection from the rain blowing sideways into the tent. The bag has box-baffled construction and uses mesh walls to maximize loft while minimizing cold spots, and I never felt any spots where the down was inadequate. The hefty draft collar secures with a snap, and the zipper is minimal and out of the way. The hood was deep enough to fit my greasy stuff sack pillow. The treated face fabric and hydrophobic down work, folks. I wouldn’t go swimming with a down sleeping bag, but I can confidently say that despite multiple storms and a soaked shelter, the bag never saturated. The Hyperion 32 weighs 16 ounces, and the 20-degree version (the one I used) weighs 20 ounces. Quilts are amazing for people who like to sprawl and don’t appreciate the confinement of a mummy bag, but they will allow some drafts, so be prepared for at least somewhat of a compromise. The 32-degree Vesper weighs just 15 ounces, and the 20-degree option weighs 19 ounces. The quilt is filled with RSD 900-fill Nikwax Hydrophobic Down, and the face fabric is treated as well. The SynergyLink system is almost like a bungee that secures around your sleeping pad, and the generous draft collar snaps snugly around your neck to prevent draft from the top. The footbox is stitched and insulated, and there are no zippers or drawcords to allow drafts through the bottom of the quilt. Shelter system before and after a morning hurricane windstorm. For two women with plenty of backcountry experience, my tent mate and I struggled a ridiculous amount with this system. “Do you think they’ll let us sit with them?” she asked, only half-joking, as the rest of the group started cooking dinner and our tarp-tent collapsed in front of us for the third time. Not everyone struggled as hard as we did, but we had trouble both rigging the system correctly and staking it securely. Aside from our setup issues (we finally sort of got it), we did not find the shelter to be adequate during periods of inclement weather. A storm blew in the second night, and the mesh body collapsed on our heads. The front is open, and the sides have a gap from the ground to the edge of the tarp. Even if you set this up knowing which way the rain was going to blow, it can still come from multiple angles. This would be a solid, lightweight shelter if you were heading out on a hike where you knew the weather was going to cooperate, or the rain/hail promised to only fall straight down. It is lightweight and seriously packable, but you should expect some protection compromises…. or be super savvy setting it up while anticipating wind and rain direction. The Mesh House and 70 Wing are available now, and will both be updated for spring 2019. I reviewed this pack earlier this season. I’m a big fan, so I was happy to see this was the pack we were using. I used the 45L, and it is also available as a 55L. The pack weighs 2.5 pounds and is streamlined to utilize the suspension system and most optimal features while shaving weight on excess features and materials. Load transfer is top notch. Super interested on long term durability of the Uberlite therma rest inflatable pad. I saw so many neo airs with holes in them on the pct it was like plugging holes was a normal part of town stops :). It’s soooo much quieter than the XLite. They updated the lining to avoid the symphony of crackles. I’ll do a more formal gear review once these are available at retail and go into excruciating detail on materials and performance. Is the zipper on the Hyperion bags full-length?